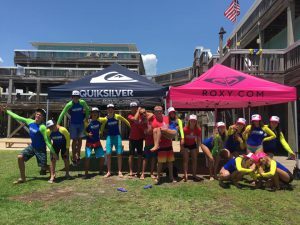 Thank You Quiksilver for Your Continued Support! Since 2001, our Roxy and Quiksilver sponsored camps have facilitated safe and exciting learn-to-surf adventures in several great locations. Our campers immerse themselves in the sport and lifestyle of surfing while gaining an appreciation for coastal conservation. If not for their support, we would not be what we are today. They provided us with equipment, exposure, and guidance critical to making our camps a success. They also happen to be one the greatest groups of people we’ve ever had the pleasure of teaming with. This company represents far more than a surf-industry giant and one of the world’s leading outdoor sports apparel company. They sponsors some of the world’s top athletes, and organize and sponsor many events and world-renowned surf contests. We respect the way Quiksilver connects today’s youth with the surfing culture and heritage through their corporate and grass-root efforts. We proudly support and represent the Quiksilver and Roxy name! Partnering with Quiksilver instantly boosts our level of credibility and professionalism. We EXTREMELY appreciate partnering with this great company. You are only as good as the people you surround yourself with and we feel truly blessed to have friends like these on our side. With a special thanks to legend and world class board builder Matt Kechele for all that he does to support local surf shops and the sport of surfing!